Hmmm. If I say, "Islam commands its followers to take over the world, and some Muslims want to do so," I'm immediately labeled a racist, a hate-monger, a bigot, and an Islamophobe. And yet we find Muslims around the world saying the exact same things that I say. Are they Islamophobes too? UNITED KINGDOM--A hate fanatic has boasted that Muslims will one day conquer Britain — by having more babies. Heres a great video for ya. And if you look at the other stories to the right. There was a man crucified according to ayat 5:33. Check it out. Islam makes people INSANE! So Islam according to this guy makes 365x500: 182500 conversion per year, yet when i was in London i only saw Muslims arab like, but i think we should't think about this too much, since we know their get this info from.... their dreams.. but what we should think about is that Islam is about conquering a land, not by conversions because even if it were true (those numbers he gave) it wouldn't be enough to take over Britain (not mentioning that many converted to Islam leave it in the next 5 years), so he is speaking about racial-religion substitution by giving birth to more babies that will be raised as Muslims, so it's about "creating" new souls for Islam and not gaining already existing lost souls to God... Where is the victory on that? In muslims mind it's all about phisical stuffs like a land...!! 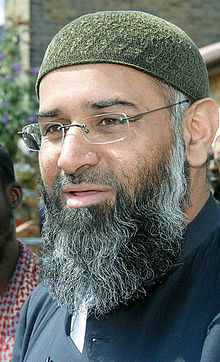 In one of the public TV debates this Anjem Choudary also Wishes to establish Islamic flag on White House, But yet Neither USA or UK take any actions against him. There are some Analysts states that If Islam grows at present rate, by 2050 Germany will be Islamic Republic. But i dont think its impossible, not just Germany even other major countries like Canada, Australia, eastern Europe, southern Europe impact with Islamic invasion. Britiain is in trouble because of islam. But good things are starting to happen in Europe. Check out the new initiative from the Free Press Society: Dispatch International. It's a new Danish/Swedish/German/English newspaper (both printed and web). It won't accept any commercials. It won't accept any government funding. It is totally free and independent. And it will describe the problems without any "multicultural sensitivity training". The newspaper will be available on a weekly basis beginning January 3, 2013. Readers can already subscribe. From a Scandinavian/European point of view it is a big step in the right direction. Since those having babies are mainly immigrants I doubt many could afford huge family sizes without a generous welfare system. Progressivism and feminism carry the seeds of their own destruction. Next stop: polygamy. Feminists and progressives are at a loss because they never really stood for anything, just tearing down Western civilisation. They may have nothing to replace it with - but Islam does.